Pictured at the 100th birthday celebration are (back row, from left) Brendan Smith, Kyle Shobe, Hailey Smith, Chris Smith; (front row, from left) Byron Endo, Robert Tsuneo Endo, Teresa Smith. 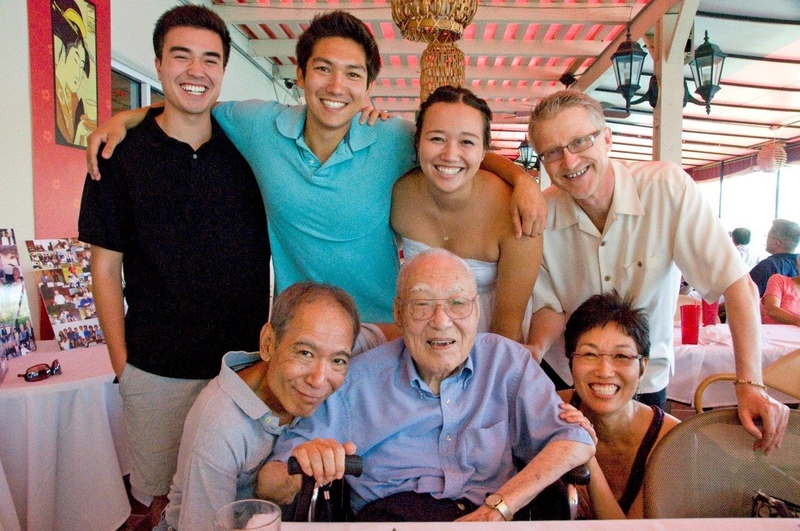 MISSION VIEJO — Robert Tsuneo Endo turned 100 years old on Friday, but his family celebrated early on July 26 at Yama Sushi & Grill on Lake Mission Viejo. Sixty relatives and friends gathered for the birthday luncheon and were treated to entertainment by three members of the Grateful Crane Ensemble. Endo was born in Seattle at the beginning of World War I and endured the humiliation of being interned at Heart Mountain, Wyo. during World War II, only to be released early to be able to help America’s fighting men by teaching them Japanese at the University of Michigan and to finally work for the federal government for 30 years at the Defense Mapping Agency in Washington, D.C. and St. Louis, Mo. Endo was the second youngest of seven brothers, two of whom died in childhood. His other four brothers lived into their 80s and 90s. His wife, Chiye (nee Matsuoka), was born in 1917 and died in 1981. The two met while he was a salesman for a Japanese food company, and they married in March 1942 so that they would not be sent to different camps. Their first child, Kazuo, was born in camp in 1943 and died at the age of 4 in Washington, D.C. Their son Byron was born in 1950 and their daughter Teresa Endo Smith was born in 1957, both in Washington, D.C. Robert Endo has three grandchildren, Kyle Shobe, 26, Brendan Smith, 20, and Hailey Smith, 18. He currently resides at Hendon Home Assisted Living in Mission Viejo, owned by Maki Sigrist.